They look so delicious!! Love the images! Those little pastries are swedish supermodels. This looks totally worth the work. I’ve made cinnamon rolls, and they’re too elaborate to make very often (because of the topping I used) – this seems like a great alternative. I’ll definitely make these soon! I was thinking to make this tomorrow! wow! Thanks for this recipe! nice pictures as well! Want some now! I’m going to try the cinnamon buns at Peter’s Yard in Edinburgh (http://www.petersyard.com/home/coffee-house-bakery/our-favourites/) when I go back home in the northern Spring. In the meantime, I might have to give these a try. 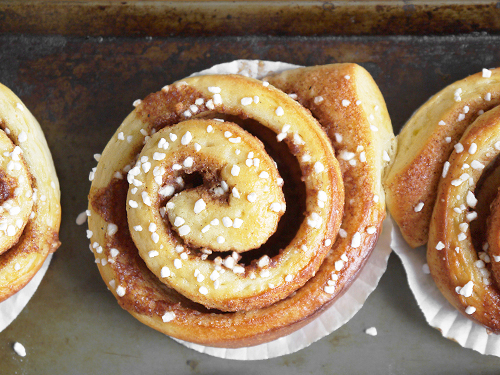 Your kanelbullar looks just perfect!! I make cinnamon rolls maybe every other month. But my gosh, yours looks just like the ones from IKEA. Ahh! Perfect! I’m so glad you shared the recipe 🙂 I have to try it! Hi Alexandra – I’m glad that you like them. I was so happy with how they turned out. I made another batch yesterday, and I’ve developed a bit of an addiction I think. Great snack in the cold weather. Thanks! Do give them a try, they are delicious. Hi Alli – it’s quite a good trick for making buns – they don’t stick to the tray so if they rise a lot before baking, you can move them apart a little bit so they stay separate. Clever, eh? Thanks for this amazing post! Such a beautiful text and pictures too. Are you going to make some more this week? 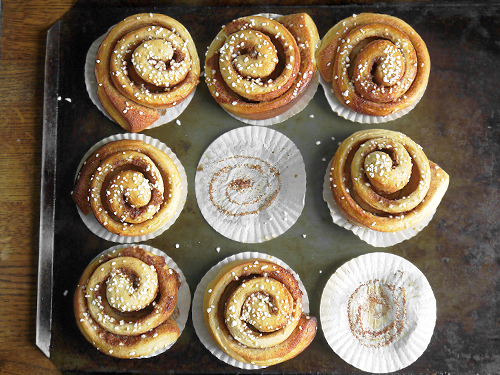 Don’t forget that the day of the cinnamon bun is on October 4th in Sweden. I have a question for you. You said that your own preference is for the ones that have been left to prove for as long as possible, to make them very light and fluffy. What is the longest you have proved them for? I reduced the yeast by half to allow for double proving time, but perhaps should I go even further? Not sure…. Based on some research and advice from other people, I have been able to come up with a really good recipe, but it can always be improved and I REALLY want to find out how! Hope you can help. Really? Don’t know the history. Maybe the Swedes pinched the recipe and put dill in it? Had these for the 1st time ever in Sweden cafes in August and fell in love. Made a double batch today – FANTASTIC! Finally found a european shop here in NZ that sells the pearl sugar too. So glad I stumbled upon this recipe. It’s a keeper. Thank you!! Hi Michelle – that’s great! These are just about my favourite thing to enjoy with a cup of coffee, so it is wonderful to hear that you love them too. I’ve also made them with nutmeg in the dough and cardamom butter in place of the cinnamon – has to be tried to be believed. Oh my! 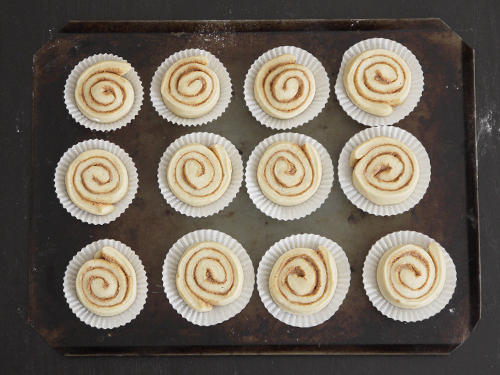 I love these adorable cinnamon treats!! One of my favourites too. 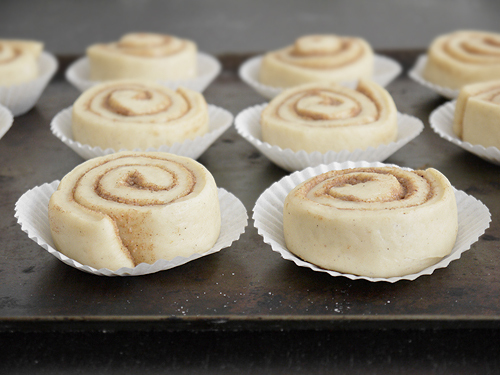 I also make a version with nutmeg in the dough and cardamom butter – delicious! They are more zesty, really worth trying. Such gorgeous pictures! I was making the sirupsnipper (which was interesting I must say. I thought they’d be much spicier) you posted last week and decided to have more of a look around in your blog. And suddenly there was Swedish being thrown around and I just had to have a look. 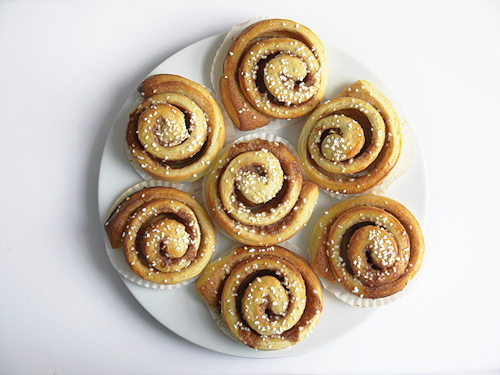 Your kanelbullar look absolutely perfect! When you wrote that we Swedes love cinnamon buns with our morning coffee I was a bit “whaaaat?” cause having something this sweet for breakfast is considered weird and unhealthy (I am always surprised when I see “perfect for breakfast” on especially American recipes, when they are for pastries!) but I realised you meant the 10am fika haha. The healthy breakfast was had hours before. Not that I would say no to something like this for breakfast, I would just feel very naughty. Must ask, since it’s Christmas and I’m knee deep in preparations for a family gathering at my place tomorrow (got it into my head that everything has to be home made): did you ever tried knäck? Such a must have for me, and most Swedes I believe, for Christmas. Glad you like the pictures. I agree that the sirupsnipper are not very spicy, but I’ve also made some things recently that are very, very spicy indeed, so it is nice to have a bit of variety. I think also that if you start to add much more spice, the flavour of the syrup would get overwhelmed. However, it’s all a matter of personal taste at the end of the day! Good to hear that you like my take on kanelbullar too. I used to adore them when I lived in Stockholm, but only ever with morning coffee (as you say, fika). I used to stick to my Scottish roots when I lived there and eat porridge, or go with knäckebröd and cheese. I know what you mean about eating very sweet things first thing in the morning – not good (apart from fruit). Knäck is, however, something I have not tried yet. I’ve tried it in Sweden, but never made it. Do you have a recipe? I’d love to give it a go, and I’ve actually got a space in my 12 days that has opened up as something I have tried has been a bit of a disaster, and I’m not entirely sure what to do in its place. I agree. Variety is nice, and my gingerbread recipe (with almonds and spelt flour!) are rather spicy so it was the perfect compliment cookie so to speak. And so pretty! My mum was worried they’ll taste too much of the white pepper and anis (she hates both) so I was quite pleased when they didn’t. Personally I never really have that morning coffee, but rather the afternoon one. Maybe it’s cause I don’t start working/studying at 8am. Also prefer my lunch at noon or later though. crazy people having lunch at 11. Still morning haha!I always go with porridge in the morning too, or toast. Gotta put in a good foundation. I do have a recipe! I make it in the microwave, which is much quicker and haven’t failed me yet. Also meant me and my brother were more easily trusted with it when younger. Not as dangerous as cooking sugar on the stove. I’ll send you an email! Thank you. It went splendidly. They were so impressed. Hi there…I decided to make these and followed the recipe very carefully but my dough didn’t rise 😦 Any advice? I have actually placed it in the oven, see if that works, but have you ever had that problem with this recipe? My yeast is new btw. Could it be just a temperature problem? Also, my dough seems pretty dry. Any troubleshooting tips would be great! I really want it to work, I have such a craving for these haha! Hi Zoe – sorry to hear that. I’ve made this dozens of times using these measurements, so I’m pretty happy that it works. Sounds like there was a problem with the yeast. If it was too old, it might not work. If you didn’t use instant yeast in the dough, you would need to activate the yeast in warm milk with a little sugar before adding it to the dough. Was there no rising at all, or just a little bit? If the dough didn’t rise enough, it might be that the dough was too cold, or wasn’t left to rise for long enough. Hope that helps! Thanks for this recipe, they were divine – light and fluffy!! Thanks – glad they worked for you!